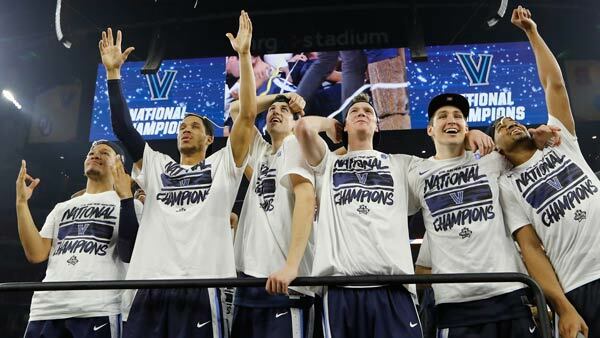 PHILADELPHIA (WPVI) -- As Nova Nation cheers on the Wildcats in their march to the 2018 Final Four, it wasn't that long ago that crowds gathered on Broad Street to celebrate Villanova. The parade, which celebrated the Villanova Wildcats' historic 2016 NCAA Championship victory and drew thousands of fans from across the region, stepped off from 20th and Market streets in Center City. Wildcats make their way down Market St.
Co-Captain Daniel Ochefu addresses Nova Nation at the Villanova Victory Parade.